Hunt wild, trophy whitetails with Buffalo County Buck Connection of Wisconsin on 3,300-plus acres of privately-owned land. Buffalo County Buck Connection is a hunting outfitter that specializes in providing semi-guided hunts for trophy whitetail deer. We also offer spring turkey hunts. Our hunting property consists of approximately 3,300 acres of privately-owned land in the heart of Buffalo County -- Absolutely no high fences; this is a fair chase hunt! 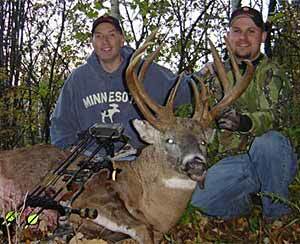 The state of Wisconsin is known as one of the best places to hunt deer in the country and Buffalo County is recognized as one of the best trophy buck regions in the nation. Buffalo County is located in Wisconsin along the upper Mississippi River valley. After many years of Quality Deer Management, it has earned a well deserved reputation for producing trophy whitetail bucks. 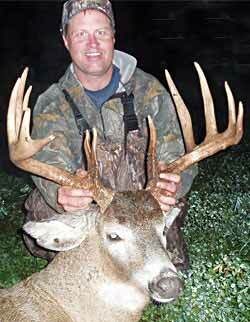 During the September through December seasons, we offer semi-guided hunts. You will be hunting wild whitetail deer in their natural habitat on 3,300-plus acres of privately-owned land in a Quality Deer Management area, the trophy whitetail heart of Wisconsin known as Buffalo County. Your hunting package will include the hunt, lodging, all meals, tree stands and the knowledge of experienced hunters and outfitters, Jeff and Dave Peil. For more information on available dates and price quotes go to the Buffalo County Buck Connection web site below. To book a hunt now call: 715-946-3211 or E mail.